As the legislature continues its work to finalizing a new state budget, I remain dedicated to ensuring that a strong commitment to the children of the Erie School District is part of the final package. I am committed to working with Senate leaders to find additional supplemental funding for the Erie School District as part of budget negotiations. As part of that effort, it’s my pleasure to report that my colleague Senator John Eichelberger, Chairman of the Senate Education Committee has scheduled a May 12 public hearing of his panel here in Erie. The hearing, which will begin at noon at Central Career & Technical School, will focus on Erie School District’s fiscal crisis and the implementation of the Financial Watch and Recovery Status System. I encourage everyone to attend this important meeting to learn more about what’s going on and to show support for our children and our schools. Prior to the hearing, members of the Senate Education Committee will have the opportunity to tour classrooms in two separate schools within the district. 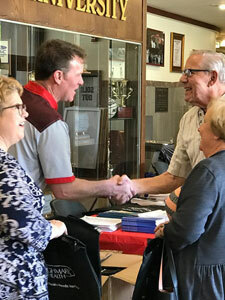 It was great to talk with many of the people who attended my 2017 Veterans Expo on April 27. 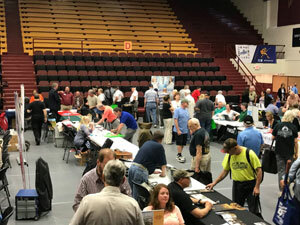 Several hundred area veterans and their families and over 75 exhibitors turned out for the event at Gannon College, which saw the Erie community come together to exhibit the services and opportunities available to the men and women who have served our nation in uniform. Overall, it was a great success! But my services to veterans doesn’t stop there, so I want to remind all of you that you can visit a special page on my website (http://www.senatorlaughlin.com/veterans-resources/) to see a list of veteran services, or call my office any time for assistance at (814) 453-2515. 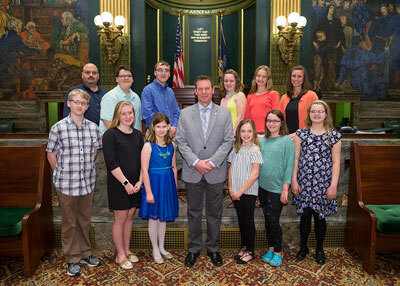 I was honored to meet with a special group of Iroquois Elementary School students who were in Harrisburg on April 25 representing their school as winners of the 2017 Governor’s Award for Environmental Excellence. The school came together to respond to the environmental damage created by discarded plastic bags as they became tangled in trees, washed into storm sewers and ended up along the tributaries and shoreline of Lake Erie. The students and their adult mentors decided they could and would make a difference. They created a plastic bag recycling program and developed a comprehensive education program to promote the collection and reuse of those items. Through their efforts 68,000 plastic bags were recycled over just a two month period. And that is just the short-term benefit of this program. Perhaps just as important is the fact that these elementary school students, their families and the community at large have gained a deeper, richer understanding of the importance of recycling. Congratulations to everyone at Iroquois Elementary for a job well done and an award you truly deserve. Just a reminder, Pennsylvania’s municipal primary election will be held on May 16. Polls are open from 7 a.m. to 8 p.m. More information about voting is available at: https://www.eriecountypa.gov/county-services/elections-voting.aspx and polling place information and sample ballots for communities in Erie County are available at: https://www.eriecountypa.gov/county-services/elections-voting/registration-voting.aspx. Traffic deaths in Pennsylvania reached a record low in 2016 with 1,188 fatalities on Pennsylvania roadways. That is the lowest number of total highway fatalities since record keeping began in 1928 and seven less than 2015, according to PENNDOT. PENNDOT recently unveiled a new mapping tool on its Pennsylvania Crash Information Tool website, www.dotcrashinfo.pa.gov, which allows the public to query and map fatality and crash data. The site allows the public to search for the number of crashes, people involved, or vehicles involved. It can be filtered by time, location and various other crash details. From 2012 to 2016, PENNDOT has invested more than $376 million on 434 unique safety projects. During that same time period, an additional $50 million was invested in low-cost safety improvements at approximately 4,000 locations. Low-cost safety improvements include centerline and edge-line rumble strips, and signing and pavement markings. Anyone owing back taxes to the state can benefit from a tax amnesty program running now through June 19. The program does not forgive taxes owed, but it waives penalties, collection fees, lien fees, and half of the interest owed. To be eligible, taxes must have been owed as of December 31, 2015. According to the Department of Revenue, 680,090 Pennsylvania taxpayers are eligible for tax amnesty this year. An additional 182,508 taxpayers who are eligible for amnesty are out of state, with nearly 70,000 residing in neighboring states. The program is expected to generate $150 million in revenue for Pennsylvania. Visit www.revenue.pa.gov for more info. The Pennsylvania State Police and Pennsylvania American Legion are accepting applications from boys and girls ages 15 to 17 for “State Police Youth Week,” a week-long leadership camp at York College designed for teenagers interested in pursuing a career in law enforcement or the military. From June 11 through 17, cadets will take part in team-building exercises, physical fitness training, classroom activities involving police and military careers, and a marksmanship course. Cadets will also visit the Pennsylvania State Police Academy in Hershey and Fort Indiantown Gap National Guard Training Center in Lebanon County. For more information, visit the Pennsylvania American Legion website at www.pa-legion.com and click on the “Programs” link or call the Pennsylvania American Legion Headquarters at (717) 730-9100. The Pennsylvania Fish and Boat Commission is sponsoring a “Fish PA! Kayak Giveaway” that includes a fishing kayak, camping equipment, and a rod/reel combo, all to be awarded to three winners. The public can enter this giveaway by visiting www.GoneFishingPA.com through May 12. No purchase is required and only one entry per qualifying adult will be accepted. The winners will be notified after June 2. For more information on issues of importance to Pennsylvania, please visit my website at www.senatorlaughlin.com and connect with me on Facebook and Twitter.